When we moved to Philippines, a friend that lives here for a while told us: „You have to get out often from Manila, because it’s a very tiring city”. Now, after two months, I do confirm. Although we are lucky because we are living in Makati, one of the cleanest and safest areas from Manila, you still need to run away from the traffic and from the pollution. Because we discovered a new passion, snorkeling, some keywords that we often use when we are looking for a destination for one day trips are colorful fish and corals. This kind of place is Anilao, Batangas, where we’ve been twice, because it’s easy to reach. In every of our two trips, we left home early in the morning (5 and 6) to avoid the traffic. We took a Grab (the correspondent of Uber) to Buendia terminal, which is some kind of buss station for different companies. Don’t imagine that you will search desperately your buss, because the drivers will try to speak with you as soon as they will see your backpack. „Batangas, sir?”. Exactly. From Buendia we took a buss to Batangas City (or Batangas terminal). First time, we mistakenly get off to Batangas Port, where the tuktuk drivers start asking us where are we going and if we want a cheap ride. We were kind of sleepy, outside it was very hot and we couldn’t hear our thoughts, so we took the offer of a driver to take us to Anilao (after we negotiated). 700 pesos (13 dollars) for a drive of 50 minutes. If you get off to Batangas Terminal, the drive with the bus will be 1:30 hours and it will cost 177 pesos (3,3 dollars) each. From Batangas Terminal you will see a sign „Jeepney terminal” and a lot of aligned trucks. 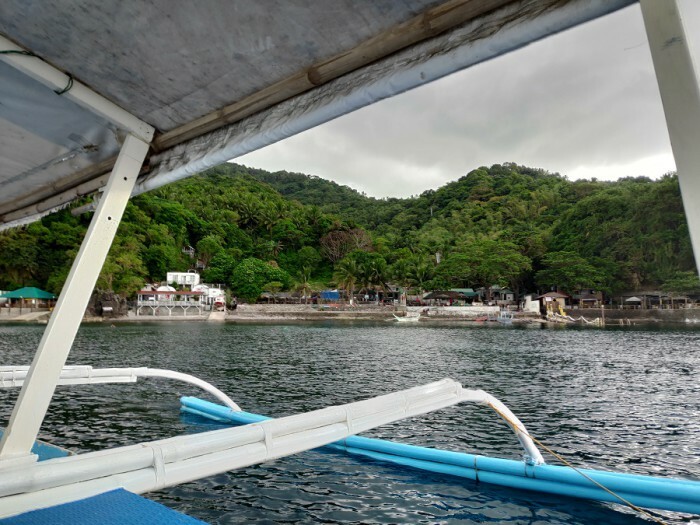 You will be guided by the drivers which jeepney you should take to Anilao. 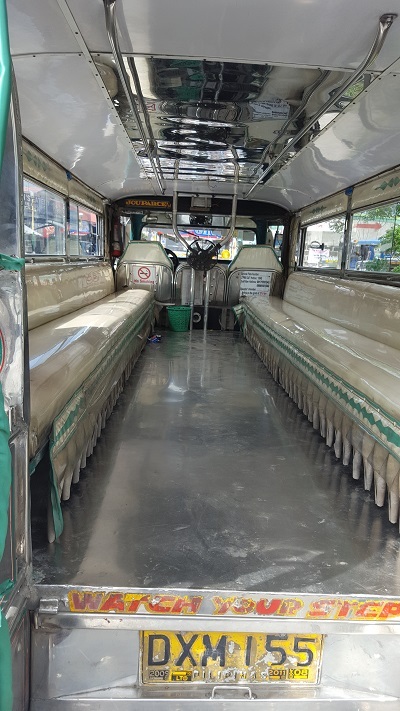 Jeepneys are trucks with two long benches, seated face to face, often without windows, where fit as many people as it needs to not have free space. The agent will verify from outside if there is some free space, so it will bring another passenger, even he will stand only on one cheek. 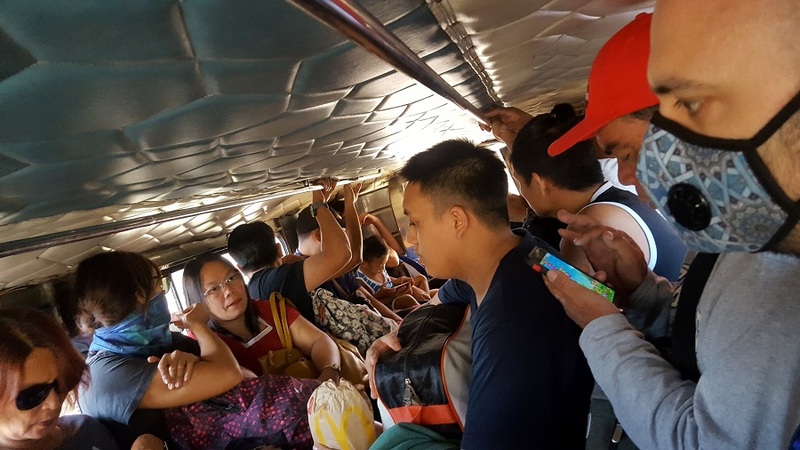 If you suffer from claustrophobia, maybe it will be better to stay in the back of the jeepney, because you might have the feeling of more space. If you sit in front of the jeepney, you will have to pass all the time the money from the passengers to the driver. You should absolutely have in your backpack a good mask, because in the jeepneys is all the pollution from the traffic, but also because you will feel all kind of smells, since you will be so close to another 18 people. The ride with the jeepney from Batangas City to Anilao takes 50 minutes and costs 40 pesos. From where the jeepney will drop you off, go straight ahead to the beach (you will see the water to the horizon). On your way to the beach, other drivers will ask you „Where are you going, sir?” „Do you need a boat?”, but we went straight to the tourism center (close to the sea, on your right will be the fish market and, on your left, the center). 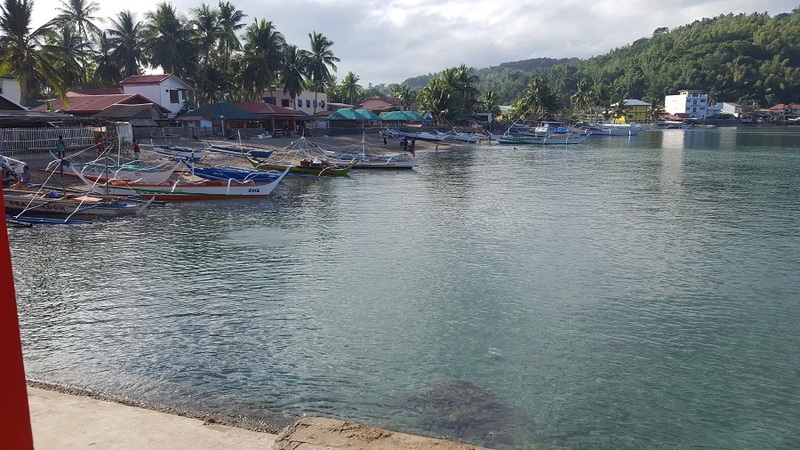 First time when we’ve been to Anilao, we were looking for a boat to rent for snorkeling, and a local man asked 3.000 pesos (57 dollars). „It’s like National Geographic, sir!”. We thought it’s a scam, so we start walking through the small harbor. With our backpacks and snorkeling equipment, with large or short pants, with hats, sunglasses, we looked just like typical tourists (only the maps were missing). We stepped on what it seemed to be a waiting room, someone said hello and asked what we are looking for. After we said „boat”, we found ourselves in some office with a lot of people dressed like for some event and with cookies on the tables. Some nice ladies kept inviting us to sit down, although the only thing that we wanted was to dive in the water. Then a lady said to me: „Let me present you to the mayor”. And I was like: „Oh, no, no”. Because we were only some tourists. But when I looked to my boyfriend, Mădălin, he was with his arm stretched over the office of the little man (I don’t think he reached the chest of my boyfriend) and he was presenting himself. After the mayor, we met the chef of the tourism office and if the lady won’t found us a boat meantime, probably they would ask us to speak at that event that looked like a meeting of tourism operators. The boat did cost 3.000 pesos, with National Geographic fish included. The capacity of the boat is 12 persons, so if you will be a large group, the price will be cheaper for each one of you (although the second time we’ve paid 2.500 pesos – 47 dollars – for a small boat where we fit only the two of us, the captain and the ferryman). Anilao it’s a special place for those who love diving, so you will see lots of resorts who rent equipment or boats and offers diving lessons. There are over 50 diving spots in the area, with a lot of interesting views to offer, as the divers say. Besides the colorful fish and corals, deep in the water there are all kinds of relics that attract the divers. Because I still swim with my life jacket on if the water passes my shoulders, I don’t have stories about treasures from the deep. But what we discovered in shallow waters it was also fascinating. 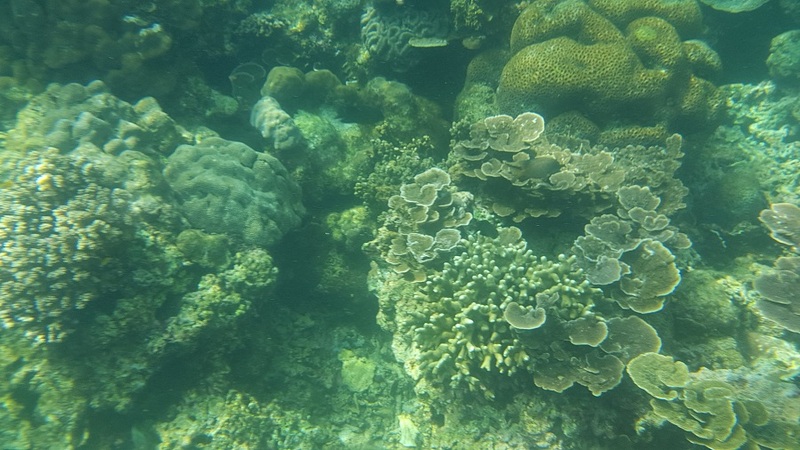 We saw some little snakes who were standing perpendicular to the seabed, stuck in the sand, corals with different shapes, sizes and textures, striped, painted fish, with swinging dorsal, who eat algae or who was chasing each other, even a sea snake. It’s therapeutic to watch all the performance underneath you. Important: do not feed the fish! We did not know about it and, encouraged by the boat drivers, that’s what we did. 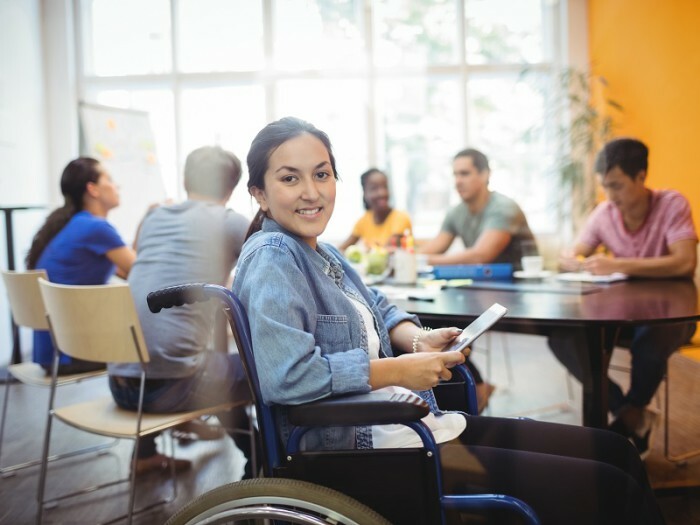 This habit makes fish dependent on humans, makes them not afraid of the humans, reduces their ability to feed themselves, and the food we consume is not beneficial for them. 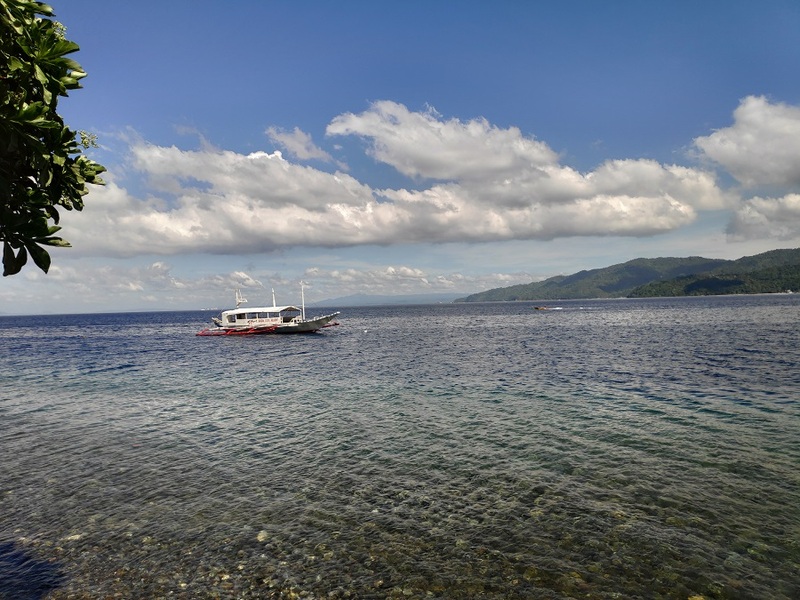 In our two trips to Anilao, we explored a reef (a dead one, unfortunately), 300 meters on the left of Anilao Scuba Diving Center, the area in front of Camp Raya resort (where we saw a lot of colorful fish) and an amazing reef near Ligpo island. Once from the two times when we visited Anilao we checked in Anilao Scuba Diving Center (known by the tuktuk divers as ASCD). We paid 1.000 pesos (19 dollars) per night for a bed and a bathroom with a sliding door. Nothing fancy, just a place where you can sleep and take a shower. The second time we went back to Manila in the same day. For eating places, we followed the recommendation of tuktuk drivers. 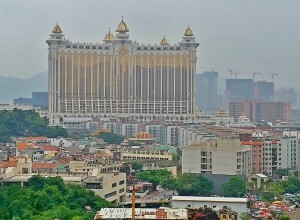 But there is some place that we loved and where we came back the second time, also. That is OMG, who doesn’t mean „Oh, my God!”, like you would expect, but Olvida & Myra’s Grill. We ate Tipalya (fish) with vegetables and plain rice and we drank Filipino beer, San Miguel. Not just we didn’t spoke one to each other, but we barely had time to take a breath because the food was so good. From the tall bar you can admire the sea. The drive from the center of Anilao to OMG costs 100 pesos. I recommend Anilao for a day trip from Manila to enjoy colorful fish, to take a bath in the sea, and necessarily for Pinaputok na Tilapya, Chopsuey and rice, to OMG (for two portions of each and two San Miguel beers, around 700 pesos – around 13 dollars). Oh, and for fresh buko who has to be sipped in the small square from the center, while you stare at the local people, and they stare at you. 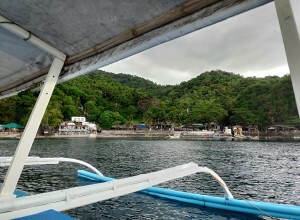 From Batangas Terminal take the jeepney to Anilao (50 minutes, 40 pesos).